The tax take on business disposals in G7 economies risks seriously undermining entrepreneurship, with entrepreneurs in the G7 countries levying an average 28.6% in tax on the successful sale of a $50m business*, compared to a global average of 19.8%, according to a new study by UHY, the international accountancy network. UHY collected information on the tax regimes of 25 countries across its international network to compare how much profit an investor in a typical small or medium size business would be allowed to keep when they sell their stake in the business, based on an initial investment of US$1m and the sale of the stake for either US$10m or US$50m. In contrast to the G7, entrepreneurs selling a similar business in one of the BRIC economies would pay an average of just 16.7% in tax on their gain. UHY says that this disparity in the rewards for entrepreneurship between the BRIC and G7 economies puts the G7 at risk of discouraging entrepreneurialism and losing out as a destination for setting up a business. UHY explains that low taxes on capital gains, especially those made by entrepreneurs, help compensate for the financial risk involved in expanding a business. They create a stronger incentive to keep growing the business, creating new jobs, with a view to attracting a substantial buyer, rather than keeping it as a smaller lifestyle business that employs fewer people and is easier to manage. The amount of tax paid by a successful entrepreneur in Germany and France is particularly high. An entrepreneur selling a $50m company realising a $49m gain would pay 46.6% or $23.3m in tax in Germany and 36% or $17.6m in France. Additionally, the partial relief for an entrepreneur in Germany selling a business of up to a profit of EUR5 million applies only to the over 55s, putting younger entrepreneurs at a key disadvantage. The tax regime for entrepreneurs is more benign in the USA than in continental Europe. An American entrepreneur’s tax bill from selling the same $50m business would be around 40% smaller than in Germany at $14.1m or 28% of the total sale price. In the UK, the despite a headline tax rate of 28% on capital gains an entrepreneur selling a business of $10m** would pay just, 9% in tax, rising sharply to 21.8% after tax reliefs and exemptions, for a sale of $50m. While the headline rate is now substantially lower than the 40% rate CGT reached in the 1990s, UHY says that the wide discrepancy in the tax treatment of the sale of a more substantial business acts as a brake on entrepreneurs’ ambition to maximise the potential of their businesses. UHY adds that in China - where the Ministry of Commerce estimates that entrepreneurial ventures are responsible for 75% of new jobs each year and 68% of exports – entrepreneurs are encouraged with a tax on capital gains below the global average. Some smaller mid-size economies, including New Zealand, Jamaica, Nigeria and Croatia seek to encourage entrepreneurialism by exempting gains from the sale of a business in most common scenarios entirely. 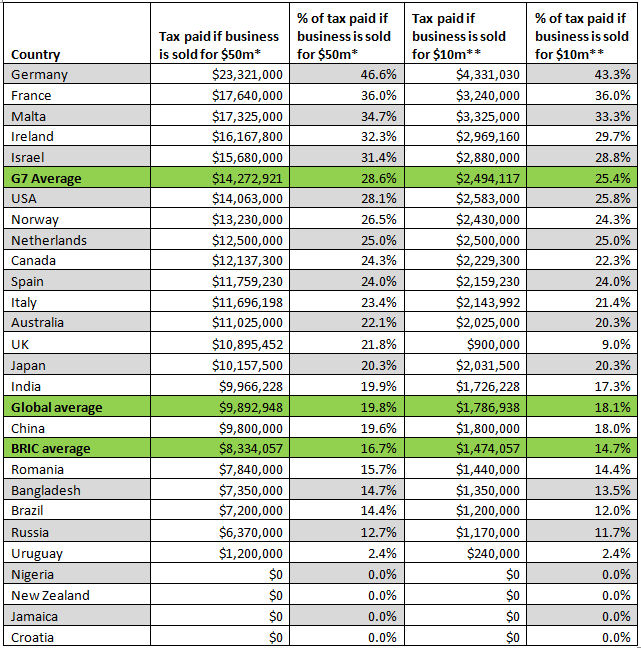 UHY points out even in Ireland, generally considered to be a low tax economy, entrepreneurs would pay 32.3% on a sale of a $50m business, higher than Ireland’s maximum corporation tax rate of 25%. The study assumed that the business did not qualify for any targeted investment reliefs (e.g. to encourage investment in clean technology), and that the entrepreneur is the sole owner and investor in the business, single, childless and a national of the country, with an annual income of US$200,000 and no immediate plans to reinvest his or her profits. *with a profit of $49m based on an initial investment of US$1m. **with a profit of $9m based on an initial investment of US$1m. *Assuming a profit of $49m.